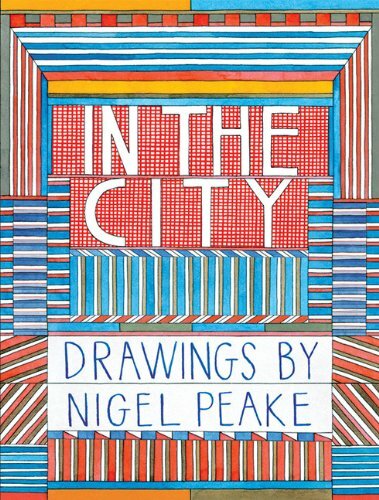 This is the companion book to Nigel Peake's previous artbook In the Wild where he captured the rural countryside in his unique visual style and interpretation. With In The City, he travels to several cities to capture their scenes and sensibilities. He seems to have a fondness for repeatable patterns, textures and geometry. There are facades of windows painted in varying shades of blue, a beautiful red brick wall with each brick carefully placed, shapes of bridges drawn with just parallel lines, sometimes there are top views of isometric skyscrapers, a drink can or piece of receipt crushed flat. He seeks out the patterns and textures, adds colours and unifies them. Even for messy scrapyards, or stacks of boxes put out for collection, or even books piled up in a secondhand bookstore, they may look a bit random, but they never look out of place. They are snapshots of interesting ways of looking at things. It's a beautiful book. I love the style.